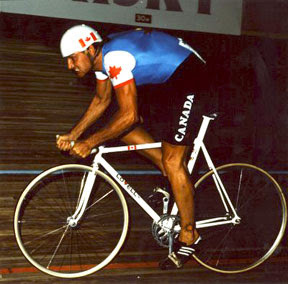 Steve Bauer at the 1984 World Championships in Barcelona. He went on to win a bronze and launched his Pro career! In the eighties I was introduced to the great cycling races ie. Le Tour, Paris-Nice & the Classics with one guide. 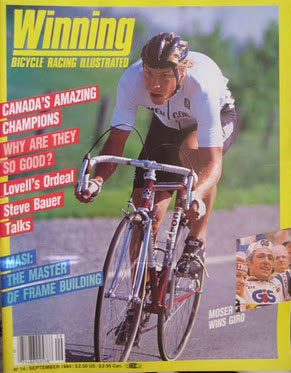 I remember it was yellow, always that familiar yellow and the magazine was called ...Winning: Bicycle Racing Illustrated. I always had to buy it from some obscure newsstand. I think it was on Whyte Avenue in Edmonton. It was a trip to get there. Quite far out. Either I had to ride or take the bus to get there. Sometimes that newsstand was sold out and that was a problem but when they did have it ...it was magical. 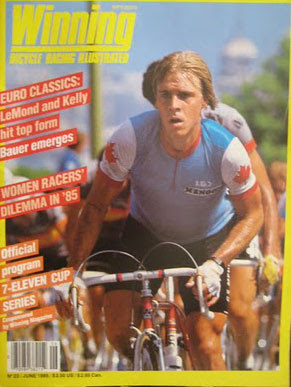 This was the cycling magazine offering fine stories on the colorful world of international cycling. Although it had an American slant to it that was ok. I found the photography utterly amazing transporting me right into the great races I admired. I'm not sure what ever happened to it. Just sort of faded away. I still have fond memories of how excellent the magazine was. Importantly, it helped bring to light on the talents of my Canadian heroes like Steve Bauer & Jocelyn Lovell. Jocelyn Lovell was a truly gifted track star in the seventies. Born in England. He was Canada's first international cycling star and with a gifted tenacity in the 1970s won gold medals at the Pan Am (Cali, Columbia) and Commonwealth Games (Edmonton). He also won a silver medal at the world championships in Munich. Sadly, in 1983 his fine cycling career was cut abruptly short, when a dump truck ran him down during a training ride near Milton, Ontario. He was left a quadriplegic at age 33. Today, Lovell still has that tenacity and is the long time Canadian head of the international advocacy group that promotes research aim at curing paralysis. As for the Winning magazines, over the years I've lost them and now I wished I've kept them ... just to catch another glimpse of all my cycling heroes of that time! Winning was my introduction to pro cycling as well. First one I bought was in winter of ’84 and it featured Bernard Hinault returning to his winning ways in the fall Classics that year. Still have a selection of some of my favorite issues. Thank you. I don't remember that one. The Badger in the classics ... very exciting!